Bennigan's Garlic Mashed Potatoes - it is easy to make garlic mashed potatoes. Home » Copycat Restaurant Recipes » Bennigan’s Garlic Mashed Potatoes – it is easy to make garlic mashed potatoes. Bennigan’s Garlic Mashed Potatoes – it is easy to make garlic mashed potatoes. Many of the Bennigan’s went out of business in 2008, and are no longer around. You can enjoy their famous garlic mashed potatoes still. 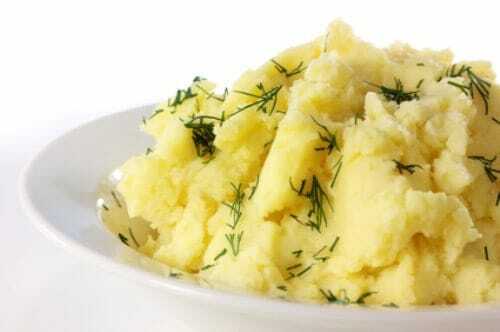 These are some of the best mashed potatoes around. The garlic in these add just the right touch to these mashed potatoes. It's is easy to make garlic mashed potatoes. To really get their flavor, these potatoes need to be baked, not boiled. So bake them in a 350-degree oven for about 20-30 minutes. This would be a great time to roast that garlic too. You can either use a traditional roaster, or you may wrap a bulb of garlic in foil and roast that, be sure to coat the bulb with some olive oil before you roast it. Remove potatoes from oven and allow them to cool. You can leave the peelings on or off; I like to leave a few of them on. Chop potatoes, add butter, and half and half, and mix with an electric mixture. Add cloves of garlic, and salt and pepper to taste. You will want to heat these potatoes in a saucepan until they warm up again. Add sliced potatoes to salted boiling water and boil until tender. Coat garlic with olive oil and wrap in foil. Place in muffin tray and bake in a preheated oven for 10 minutes. Add garlic, butter, white pepper, cilantro, chives, Cream Cheese & Sour Cream and lightly mash, but be careful not to overmash. Leave lumps. Serve immediately or refrigerate, uncovered, and portion when cooled. I ordered these every time I ate there. Thanks for the recipe!